Scotch tape may not be as versatile as duct tape when it comes to mending things, but it still has a number of weirdly practical uses that goes beyond taping down wrapping paper and sealing envelopes. Double-sided Scotch tape can be used to discourage cats from using your favorite furniture as their favorite scratching posts. You can wrap a wad of paper towel in Scotch tape sticky-side up to safely pick up tiny bits of broken glass from the floor after an accident. And if you are ever in dire need of a party trick for a kid's birthday party, you can push a pin into a balloon without popping it with the help of a single strip of Scotch tape on its surface. 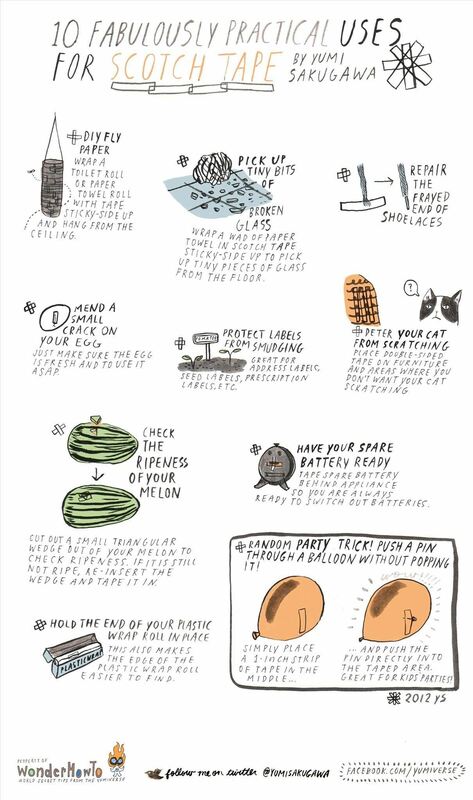 Got your own fabulously practical uses for scotch tape? Share with us by commenting below! Place a piece of tape on a sticker or sales tag. Rubb on the tape. On the sticker while holding on to on end of tape. Then in a swift motion rip the tape of the sticker.it may take 2 tries to get the sticker off.